All our resorts are specifically designed for romance. Stroll along serene garden pathways or wade into hidden grotto pools; there are plenty of enticing places that bring you together. Plus, since all our resorts are all-inclusive resorts, you can choose to do as much, or as little, as you want without worrying about bills or tips during your stay. Make your most romantic dreams a reality with the most extravagant collection of rooms and suites in paradise. No other all-inclusive resorts take their rooms and suites so seriously. We have thought of everything to make your accommodations a dreamy romantic retreat. Surrounded by uncompromising comfort and world-class luxuries, you may have trouble deciding what resembles paradise more, our indulging rooms and suites, or our pristine Caribbean beach. Our All-New Tranquility Soaking Tubs are found on private patios and balconies of most of our rooms and suites located behind elegant privacy curtains, they create a whole new way to celebrate romance al fresco. 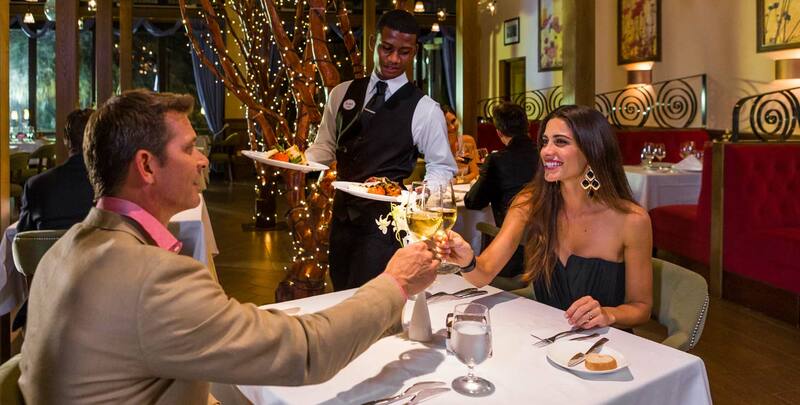 The 5-Star Global Gourmet™ program at Sandals transforms dining into unforgettably romantic and exquisitely designed culinary experiences unmatched among any other all-inclusive resorts. Best of all, you can dine wherever and whenever you wish - it’s always included and always unlimited. What better place to feel the warmth of the Caribbean than gathered around a fire pit? Sandals features the most unique and romantic fire pits in ideal locations throughout the resort, offering spectacular vistas and setting the mood for romance. 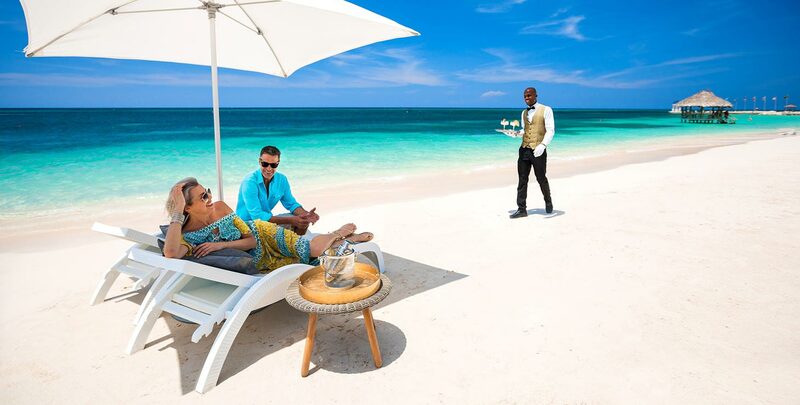 Experience the allure of an offshore island adventure at Sandals Royal Caribbean and Sandals Royal Bahamian. Just minutes from the resort’s shoreline, our offshore islands offer secluded beaches, spa treatments, themed restaurants, pools, swim-up bars and more. Relaxing in paradise is easy when you're lounging on a hammock suspended over crystal clear turquoise waters. Soak up the Caribbean sun on these tropical over-the-water hammocks at Sandals Royal Bahamian, Sandals Royal Caribbean, Sandals Montego Bay and Sandals South Coast. Discover a sprawling paradise set amidst the unforgettable beauty of the Caribbean Sea. Whether you choose to take a stroll among our tropical gardens or sheltered white-sand beaches, Sandals creates an exclusive hideaway suited to private moments.